Can you think of a time when you felt so loved and content that you could stay in that moment forever?! That is exactly how my friends made me feel on my Bachelorette weekend. They are so good at loving and celebrating each others successes, excitements and special occasions, and this was no exception. So where should I start? The basics seem like a good launching board, so we'll begin there. All of my sweetest memories from junior high and high school involve Destin. My family has a home there, so spending this fun weekend in my favorite spot seemed like a no-brainer. There are awesome hotels and AirBnbs in the area, but staying somewhere convenient with sentimental value made our home an easy choice. Not to mention, it is FREE, which at this point in life is v important. The house is situated on a canal in a cul-de-sac on Holiday Isle, so we have access to the water straight from our dock, topping the list as one of my favorite parts of this house. My friends had it PERFECTLY decorated when I arrived (at midnight lol) and it was the perfect start to a fun weekend! Adding all of the girly touches and extra details really make it feel like a Bachelorette trip. I know how much time they spend perfecting it, so I felt all the luv. All of the CUTEST decorations and accessories came from Stag and Hen. You MUST check them out. You can shop by theme and it is such a good place to start your decor planning. Just a fun tip: make sure to take pictures! I’ll cherish the sweet memories like this for years to come! Does anyone here NOT plan their trip around food? Okay, good. We are among friends then. We ate at the house for lunch or packed sandwiches for the beach but for dinner we ate out. We went to Brotula's and it was ahhhmazing. They did a great job accommodating such a big group. The food was good but the bushwakers were even better. The deck had a gorgeous view of the water and I will definitely go back there. Big thumbs up. After dinner, we went to AJ's. It is bar and restaurant that is pretty close to Brotula's. It has 3 floors of music, drinks and dancing. We had a BLAST. Like the kind of blast where you stay until the bar closes and then walk to Whataburger at 3 am. The band was really fun and they even had a DJ who took our requests. We ran into several other Bachelorette groups, so it was fun to dance with a bunch of gals! I loved the picture backdrop that Joely made for us before we went out. It gave us the perfect spot to snap some shots before dinner. It tied in perfectly with the theme too! I definitely recommend adding that to your list of decorations for the next trip because the pictures turned out too cute! We were super basic and wore the black and white ensembles but look how cute it turned out! A trip anywhere with a beach is SO EASY. You don't have to make a day full of plans because everyone is content with laying out and enjoying the sun. Sadly, our beach time got cut short because of tropical storm Alberto, but somehow we all still got sunburned. As party favors for my girls, I got them these monogrammed hats. It was a cute way to have a matching item that they would hopefully wear again. WeddingWire has some amazing games, ideas and tips for planning the perfect Bachelorette Bash. 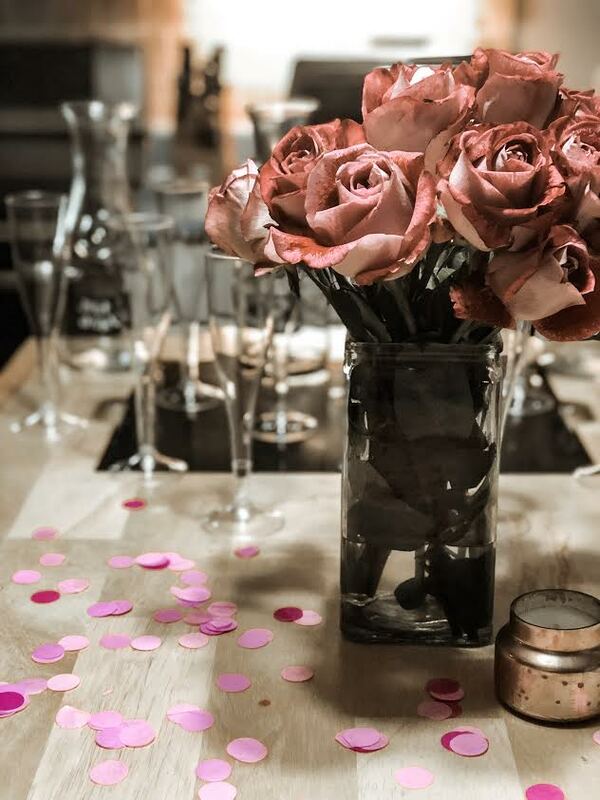 Some of my favorite articles are Planning 101, The Bachelorette Party Games Your Squad Will Want to Play and Six Ways to Throw a Stress-Free Bachelorette Party. WeddingWire has become my go-to with my big day just around the corner, so getting tips for this trip from their site was no exception! -Go with the flow. Our trip got cut a day and a half short because of severe weather but we all still had a blast and enjoyed the short time we had together! -Bring games or have games in mind to play. If you have downtime, this will fill it in a fun and free way. Or if a hurricane comes (ha), you have something to entertain yourself. -Carbs don't count! I've been trying to eat healthy in preparation for my honeymoon...have you seen my fiances ripped abs? Lol it is a struggle standing by him in a bathing suit! But on your trip, don't think about those things! This only happens once so just relax and enjoy yourself...she said 3 cinnamon rolls later. -Let your guard down. Your friends may have embarrassing games to play or funny things to say that put you on the spot, let them! -There's nothing better than girlfriends. Really, God has blessed me so much by giving me encouraging, sweet, supportive and fun-loving women to surround myself with. If you need more Bachelorette trip ideas for Destin, send me a message! I have been there so many times that I feel like a local and would love to help you nail down a plan. Here's to hoping that you get to be the Bachelorette one day, and that you have the chance to celebrate your friends in the sweetest season that they will never, ever forget.